Engine: M.A.N. K7SZ70 oil engine, by Mecanica Pesada S.A. Tourbate 13,300 bhp 15 knots. Cargo Handling: Fitted with four electric hydraulic deck cranes of 25 tons SWL suitable for grab handling. 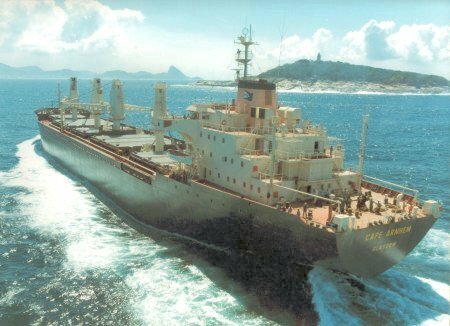 April 1981: Completed by CCN-Maua, Rio de Janeiro (Yard No. 124) for Lyle Shipping Co. Ltd Glasgow. Scottish Ship Management Ltd., Glasgow, managers. 1984:	Managers became Scottish Ship Management Ltd. Bermuda flag. Owners later became Arnhem Shipping Co Ltd. and flag transferred to Hong Kong. 1988: Sold Expedient Maritime Co Ltd. Kassos Maritime Enterprises Ltd. Managers, renamed ATLANTIS TWO Cyprus flag. Lauritzen Bulker Pool. 1998:	Sold, Calatis Shipping Co. Ltd. Pacific & Atlantic Co. Ltd., managers. Cyprus flag, renamed WORLD AMBER. 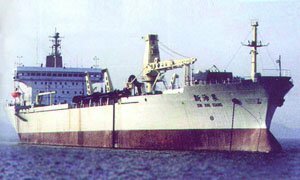 2001: Sold to China Harbours Engineering (Group) Co. Ship Department. China flag. 2003: April, renamed XIN HAI XIANG. 2005: February, converted to a trailing suction hopper dredger. China Govt. Chec Dredging, renamed XIN HAI XIANG. Shanghai Dredging, managers. Main Photo sent in by Steve Hill (Electrician), information by J. Drury.